It wasn’t the narrow passes and cliff drops. Nor was it the rough terrain, the prospect of nights sleeping in the mountain wilds, lack of money…snow leopards. No, what stymied Paras Loomba on his mission to light up the Himalayas were the horses. How do you convince a horse that a solar panel is not a threat? How do you make a solar microgrid light enough and compact enough so that the horse can even carry the weight up the mountain – yet keep it powerful enough so that it can energize several housholds? This is just one of the logistical challenges the 28-year-old engineer faced as he made plans to carry solar microgrids as high as 17,000 feet into some of the world’s most remote mountain communities in India’s Himalayas. On his first night out, he found himself eating soup by a fire in a small stone hut with a shepherd. They were two hours from the first village Loomba hoped to illuminate, a 1,130-year-old community that not even Google maps knew about. The shepherd told him that he was more than welcome to visit the village the next day. But forget the idea of installing an electric grid. The government said it was impossible. Problems like the horses had made others give up on the villages. After all, many are days away from any vehicle-ready roads and cutoff from the world nearly half the year. What the shepherd didn’t know was that Loomba was on a quest to follow an “unreasonable dream,” as recommended by legendary polar explorer Robert Swan. Loomba had spent three weeks in the Antarctica with Swan in 2012 studying climate change. When he returned from Antarctica to his job as an aerospace engineer at an Indian branch of Texas-based National Instruments, he asked if could work on solar or microgrids. His request was denied, so he resigned. When he told others at work that he was leaving to “climb up the mountain and light up the villages” they thought he was probably disguising plans to work for the competition, he said. Three years later, they now know better. Loomba and his team of volunteers from around the world have installed 30 solar microgrids in 10 villages in the Himalayas, a mountain region with nine out 10 of the world’s largest peaks. Now down from the mountains for the winter, Loomba described his next steps in an interview from Delhi. When the weather clears he plans to start again, this time with a 2016 goal to bring solar microgrids to 40 more Himalaya villages. Lighting up the Himalayas one solar microgrid at a time. He draws volunteers and accomplishes the work through his impact tourism company, Global Himalayan Expedition. Impact tourists try to help improve infrastructure where they go. Loomba knows the region from his childhood. He would travel there with his father, who was an officer in India’s Army. His regiment delivered supplies. But only during his adulthood treks did Loomba come to appreciate the sustainable, self-sufficient lifestyles the villagers had preserved. Unfortunately, the communities face extinction as their young people leave to become educated and then choose to stay in a world with wifi, television and central heat. Electricity, the villagers hope, will bring them back. But just electrifying a remote village isn’t enough. Sad stories have been reported out of both India and Africa of solar panels broken and forgotten and villages gone dark again. Loomba didn’t want the same to happen in the Himalayas. So he created a business model for the villages to sustain their simple grids. First, he trains someone in the village to do basic maintenance. Second, he requires a commitment from the households to pay a connection fee plus a small monthly sum. The money is deposited into a village-run bank account, and is used for any repairs on the direct-current (DC) solar microgrids – or the eventual replacement of the solar panels and batteries. Of course, cash isn’t ample in villages where people survive largely on what they can grow and herd. But with their new electric outlets, the villagers suddenly have something to monetize. The villages become beacons of light on travel maps for the summer-time flow of American and European trekkers and wildlife photographers. The tourists now have places to recharge their phones and take advantage of basic electrified-amenities before moving on. The villages set up guest rooms – about two to six per village — for ‘home-stays’ where travelers pay to spend the night. Each season, as many as 400- 500 tourists pass near the villages that are on popular routes. Villages on less traveled routes may draw only 50-100. But villagers hope their new electrification may draw more tourists to the less traveled areas. The project is also about educating the Himalayans about clean energy. 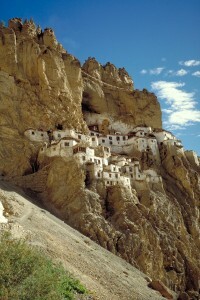 Loomba’s first effort was an education base in Ladakh (Land of High Passes) located at about 12,000 feet. Twenty-five volunteers from nine countries spent a month in 2013 building an education base (E-base), a solar-powered room that houses a digital library, tablets, robotics equipment, Internet and various other tools to help the local kids learn more about the outside world — and for the outside world to learn about them. They set the learning base in the town of Leh, a tourist mecca where floods from a cloud-burst killed about 300 people in 2010. “The idea was to build something in that area where climate change had caused the local people to suffer,” he said. Fifty percent of the funding for the E-base came from the volunteers and the remainder from sponsors. Robert Swan attended the site’s inauguration attracting attention to the effort. Loomba decided on a DC solar microgrid configuration when getting ready to install the first village microgrid, which services 10 houses with about 90 rooms total. DC is safe, he decided, limits conversion losses and makes it easy to add devices. But still, his team was daunted by the idea of installing an actual grid; many were non-engineers. So he sought out the advice of a senior engineer and explained that he wanted a grid that was quick to install and easy to maintain. “He said you just need a 250-W panel and two big batteries and the grid is done. It is not so technical – it is very simple,” he said. So Loomba and his team were ready to go — or thought they were. Then they realized there was a catch. “I needed to ask the horse,” he said. It turned out that the horses didn’t much like the microgrid. His tourist guide groaned when Loomba told him the panel batteries weighed more than 70 kilograms and the solar panels were 7 ½ feet long. He explained that the horse would not, could not carry such equipment. So Loomba had to re-engineer the system into a horse-acceptable microgrid. Lesson learned? No matter how technically competent you are, if you are not acclimatized to a region, it is an issue,” he said. With smaller panels and lighter batteries, the redesign worked. The horses got the equipment up the mountain. After one day of work, the team had the microgrid wired and operating. “People were amazed. They said, ‘How could you do this in one day? The government couldn’t do it for years, and we had no hope,’” he said. This year, the team plans to begin by electrifying a 2,550-year-old village called Phugtal, which is inside a monastery inside a cave. 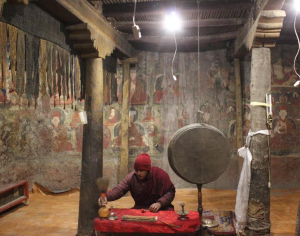 In all, they plan to light up about 40 villages in the Zanskar valley of Ladakh. The area is considered the most remote in the world, he said. The average mountain height is about 19,700 feet. Loomba is now raising money for the effort, which is being championed by IEEE. He says it cost about $8,000 to $10,000 per village, with much of the expense in transporting the equipment from where it’s manufactured in Delhi to the remote villages. He also is working on designing televisions and other energy-efficient appliances sought by the newly electrified villages — even a DC-compatible electrified grinder. 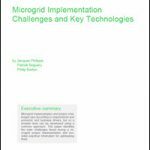 The microgrids range from 200 watts to 600 watts and can support a range of energy efficient DC appliances, including high lumen LEDs, LED solar lights for community lighting and DC LED televisions for community education and recreation. Once the next 40 villages are completed, there is still plenty more work to do. There are about 800 remote villages throughout the Himalayas. Why does Looba think he can do what the government has not? 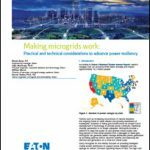 Read more stories about remote microgrids by subscribing to the free Microgrid Knowledge newsletter. Excellent news – Well done!!! Please share the contact details for Mr. Loomba so that we can get in touch with him to let him share his business model and at the same time extend all our possible help to enhance this very Business Model.